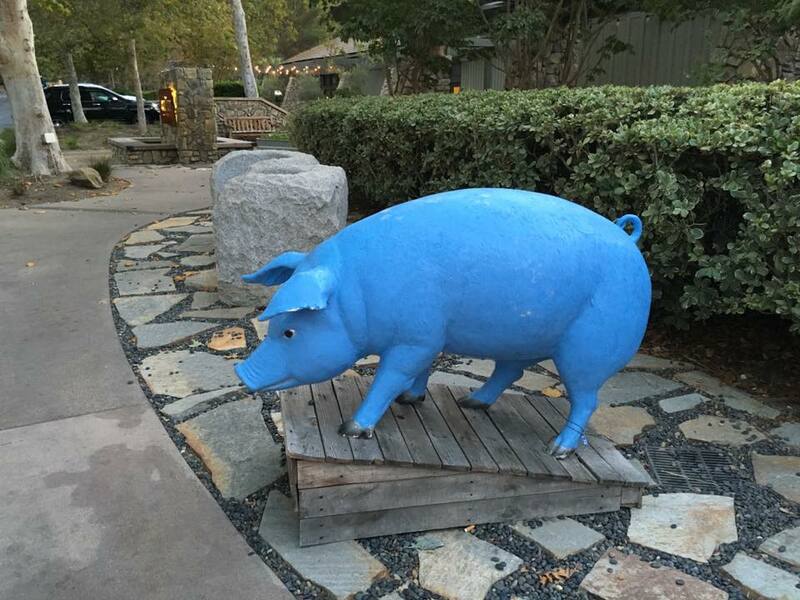 The whimsical blue pig welcoming diners to Cork Fire Kitchen was our first clue that our stay at Temecula Creek Inn was going to be anything but ordinary. We ditched the kids are snuck off for a quick staycation last week and Temecula Creek Inn did not disappoint. The moment we turned off Rainbow Canyon Road onto the rose-lined driveway, we felt transported to a quieter, calmer place. The resort is tucked against a hillside. The grounds are fragrant and lush, with oaks and eucalyptus towering overhead. The hotel rooms are in a series of low-profile buildings that nicely complement the natural beauty of the surroundings. We checked in and discovered our room to be a calming, peaceful retreat with doors opening onto a patio overlooking the ninth hole of the Oaks golf course. We are still mastering the art of the selfie so excuse the amateur photography, but don't we look relaxed?! 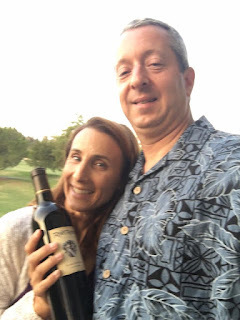 This bottle of Sangiovese from local winery Robert Renzoni Vineyards was a perfect example of today's Temecula wines: the "big reds" so many of us red wine lovers are enjoying now. 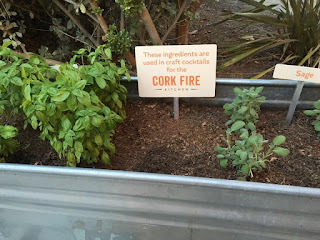 One of the highlights of our trip was dinner at Cork Fire Kitchen. I really enjoyed the Temecula Creek Inn's restaurant in its previous incarnation, but Cork Fire takes local, fresh, modern dining to a very high level. 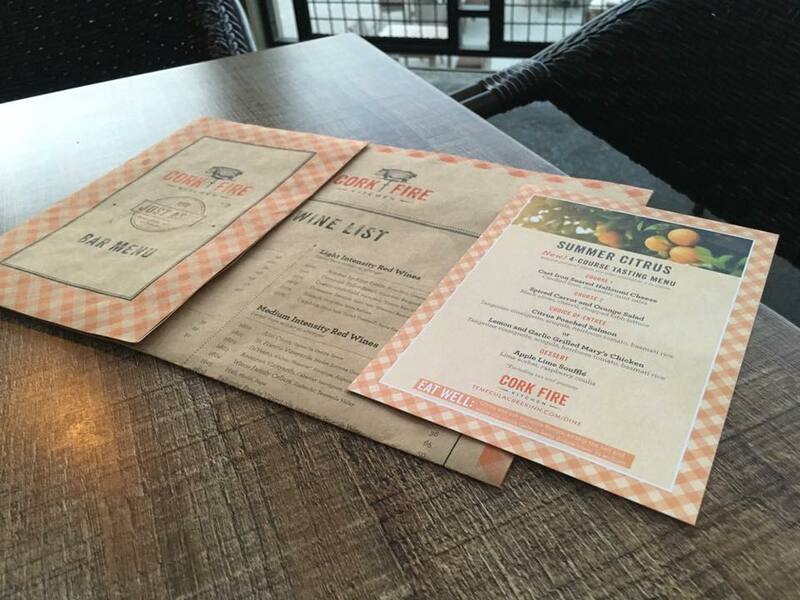 The dishes are simple and prepared with fresh ingredients, and it all comes together wonderfully. 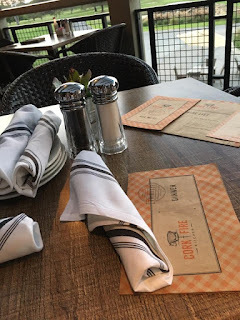 The restaurant has a great indoor-outdoor design with a central bar where guests can watch the unique craft cocktails being made. 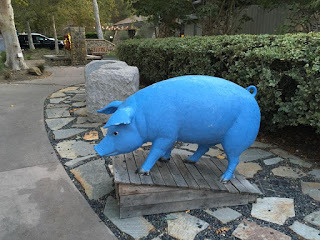 The food and drink offerings change regularly with the seasons, and since this is Southern California, there's not a "bad" season, just different tastes for each time of year. Cork Fire Kitchen serves breakfast, lunch, dinner, desserts (AMAZING desserts! ), and drinks of all kinds. We ate there for dinner, and as we walked in we noticed an unusual looking appetizer on another table so we had to try it: Crispy Green Tea Soba Noodle Nest. The menu description was: "shitake mushroom salad, fried leeks, mirin glaze" and it's a "don't miss" that would be perfect to share for the table. 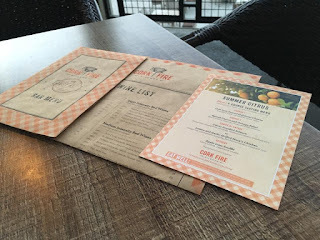 We also had the Hummus Trio, which was beautifully served on a rustic cutting board, Hearts of Romaine Salad, which had terrific flavor and texture contrast with sweet, salty, and tangy tastes, and Summer Vegetable Minestrone, which was light, fresh, and flavorful. 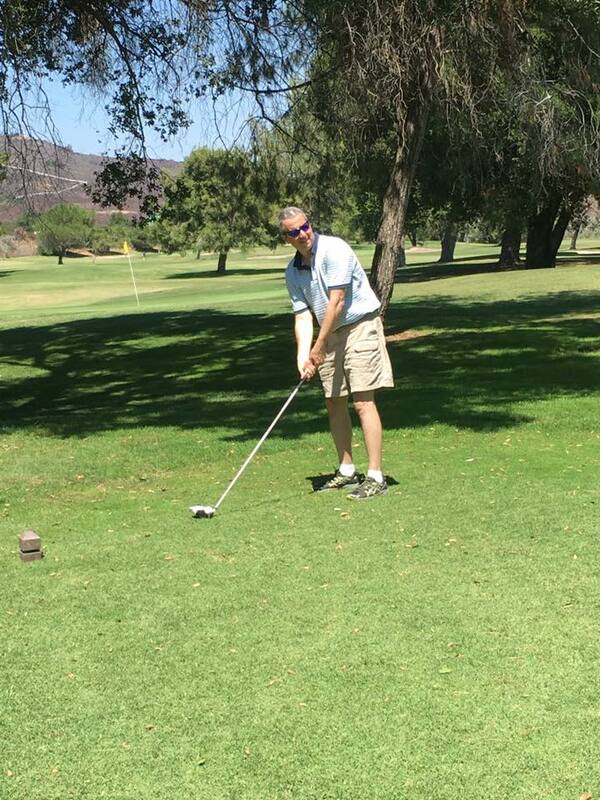 We started our morning at the driving range with a lesson from one of their PGA golf instructors, then we were off! The best part of a staycation at Temecula Creek Inn was the feeling of being a million miles away from the hustle and bustle of daily life, yet only having to drive five minutes to a magical gem tucked right into our very own city. 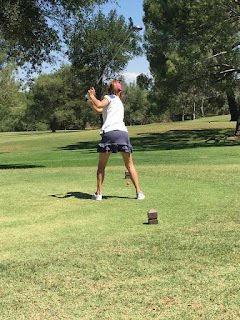 Temecula Creek Inn provided a complimentary hotel room and golf . The opinions stated in this review are my own.